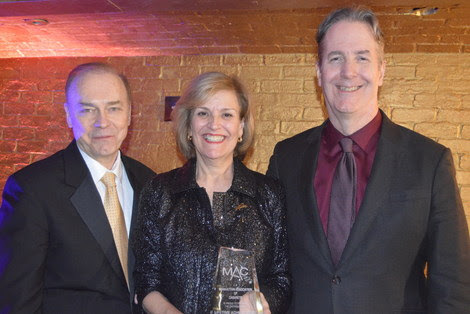 On Tuesday, Showbiz Chicago’s favorite guest Karen Mason received The Manhattan Association of Cabarets (MAC) Lifetime Achievement Award at Sony Hall in New York City. 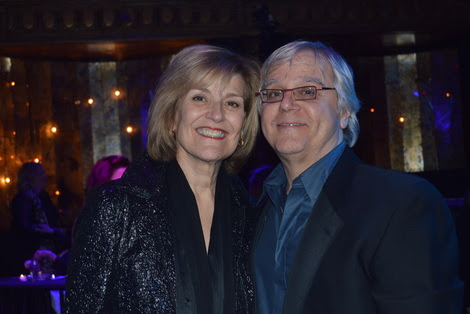 The 33rd Annual MAC Awards was produced by Julie Miller and directed by Lennie Watts, with musical direction by Bobby Peaco. MAC’s mission is to advance the art and business of live entertainment. A trade association, its activities are designed to heighten public awareness of the field’s contributions and vitality, to honor its creativity, to build its current and future audiences, and to speak out as an influential voice on behalf of MAC members and the industry at large. It’s annual MAC Awards celebrate the very best in NYC cabaret, with competitive awards voted on by the active MAC members. Karen has starred on Broadway, Off-Broadway, on television, and on recordings, and “has few peers when it comes to ripping the roof off with her amazing voice that knows no bounds!” (TheatreScene.net). She is a 12-time MAC Award winner, won the 2006 Nightlife Award for Major Female Vocalist, and has three Bistro Awards. On Broadway, she has appeared as Norma Desmond in Sunset Boulevard, Tanya in the original cast of Mamma Mia! (Drama Desk nomination), The Queen of Hearts in Wonderland, Velma von Tussel in the final Broadway company of Hairspray; “Monotony” singer and Mazeppa in Jerome Robbins’ Broadway; Rosalie in Carnival (Drama Desk nomination); and featured roles in Torch Song Trilogy and Play Me a Country Song. Karen spent more than a year on tour in the North American premiere of Andrew Lloyd Webber’s Love Never Dies playing Madame Giry. 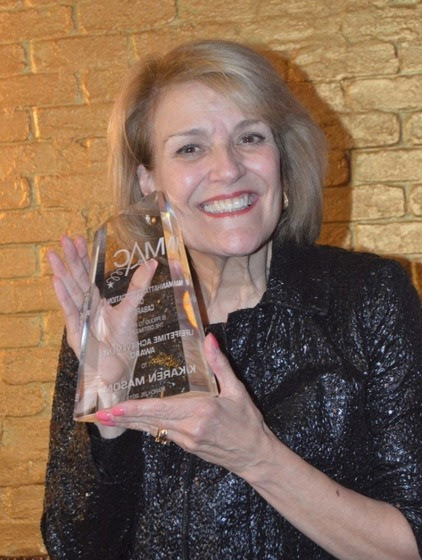 Karen won the Outer Critics Circle Award for her performance in And the World Goes ’Round, and starred Off-Broadway in her own show Karen Mason Sings Broadway, Beatles and Brian. Her highly acclaimed recordings include It’s About Time; her 2009 MAC Award-winning Right Here/ Right Now, The Sweetest of Nights, the MAC Award-winning When the Sun Comes Out; Christmas! Christmas! Christmas!, Better Days (including the 1998 Emmy Award-winning song “Hold Me“); and Not So Simply Broadway. She has been featured on the original cast recording of Wonderland, Jeffrey (Varese Sarabande), the studio cast recording of Wonderful Town (JAY Records), the original cast album of And the World Goes ’Round (RCA Victor), The Child in Me, Vol. 1 (Harbinger Records), and Lost in Boston II (Varese Sarabande).